Pink Lemonade: Autumn Blessings...the tasty way! Do you remember this card? 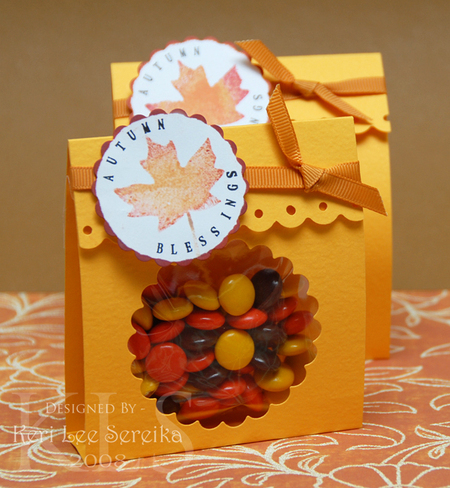 I had stamped up a few extra "Autumn Blessings" and die cut them out using my Scalloped Circle Nestabilities. I figured since I had set all those Small Letters in my JustRiteStampers Monogram Stamper I figured I might as well put it to good use! LOL Anyway, I saw a cute little die cut box on just JustRite blog that used an Accucut Long Die...and it seemed a far too simple project to actually need the die for...so I decided to figure out how to do it with a strip of cardstock, my Scor-Pal and a Scalloped Circle Nestabilities die from Spellbinders! :) And here is what I have come up with! I have plans to do a "Christmas Themed" set and hope to have full instructions and tutorial then! Buf for now, Enjoy! Stamps: Monogramstamper, Small Letter Set - JustRiteStampers; Fall Fun - October Afternoon.